Children learn to play together and take on different character roles which helps to build their confidence. This type of play also encourages relationships and helps to develop early stages of friendships. Children develop and strengthen their fine motor skills continually during their role play activities for example using the pouring action to make a cup of tea or pressing buttons on a till. Learning to fasten buttons or dress a baby are skills that develop through role play and help in every day life too. When a child feels comfortable in a situation they are familiar with, the home corner for example, they become more confident and will engage in conversation with their peers more freely. Experiencing real life situations such as a hospital or dentist visit can be easier if experienced in the role play area first. Role play gives children the opportunity to develop early reading and writing skills in an inviting way. They may choose to create their own menu for a restaurant or keep an appointment book for a dental/ doctors surgery. A shop, hairdressers or market stalls give fantastic opportunities for counting – whether it be money, different types of fruit and vegetables or people. There are plenty of ways to link the home corner theme to maths and problem solving games that can be enjoyed during group time too. 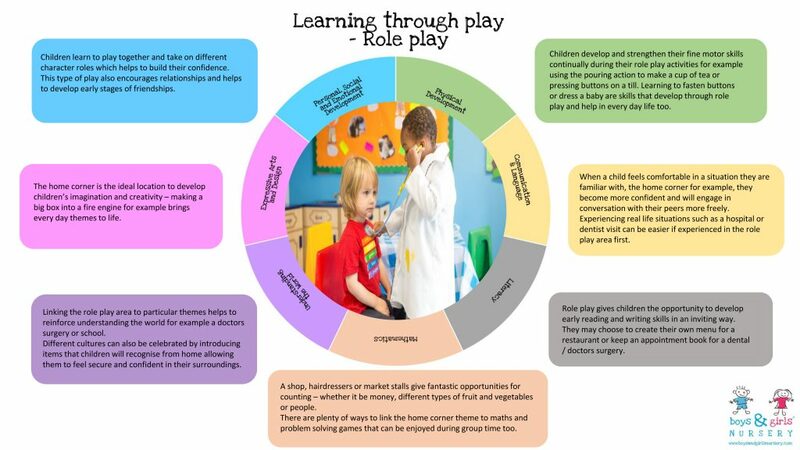 Linking the role play area to particular themes helps to reinforce understanding the world for example a doctors surgery or school. Different cultures can also be celebrated by introducing items that children will recognise from home allowing them to feel secure and confident in their surroundings. The home corner is the ideal location to develop children’s imagination and creativity – making a big box into a fire engine for example brings every day themes to life.